Classic White limestone also known as White Jogja Stone is beautiful bali natural stone. Classic White Stone has a white pure color and when it installed for outdoor tiles in the hot sunlight it will not makes the stone hot so it very suitable for outdoor limestone tiles. Some people in the market call this classic white limestone as Paras Jogja Stone / Paras Yogya Stone. 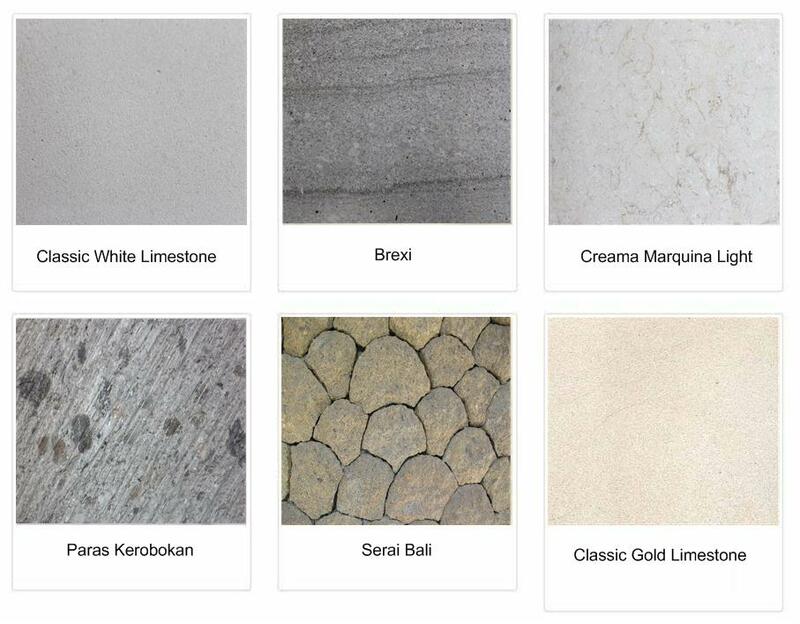 This is the best Indonesia White Stone for flooring outdoor tiles. Brexi Stone is another stunning bali natural stone. Brexi stone has grey color based with white color grain makes this natural stone Brexi stone only suitable for wall cladding as this kind of bali stone is too soft for floor tiles. Creama Marquina Light (CML) Stone is a solid bali limestone and very suitable for indoor flooring, outdoor wall cladding and indoor walling such as in the bathroom. Another famous bali natural stone is Paras Kerobokan Stone which is known as well as Paras Kerobokan Bali Stone. This Bali Paras Kerobokan Stone is used in many luxury villa in bali especially for wll cladding with etched finish.